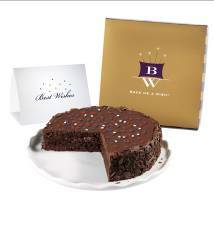 Give Back: Send a holiday cake to a friend and one of our troops with Bake Me A Wish! The holidays are difficult for military members serving overseas away from friends, family and the comforts of home. Bake Me A Wish! has partnered with Soldier’s Angels, a non-profit organization dedicated to helping the families of our troops, in order to offer a delicious treat: the chocolate mint “Freedom Cake”. When you purchase one of these gourmet cakes for a friend or family member, Bake Me A Wish! will also send one overseas to a soldier, donated in the name of your recipient. The cake you send to a friend or family member will be accompanied by a card letting them know that a cake has also been sent to a soldier in their name. The “Freedom Cake” is layered with chococate mint brownie and covered with fudge frosting, mint chips and chocolate shavings. The price for the two cakes is $75 and includes shipping. Also, 5% of proceeds go to support Operation Birthday Cake, which sends birthday cakes to soldiers stationed around the world.